A former minister has warned that the UK's main parties are "complacent" about the British National Party, after the BNP won a local election. 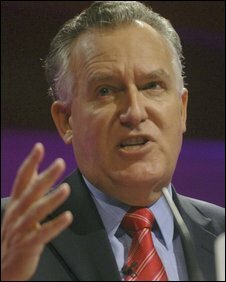 Labour MP Peter Hain told the BBC that Labour's own supporters were being targeted by the far-right. He said the government needed to make sure that local, rather than foreign, workers were prioritised for jobs. A BNP leader said the recession had helped the party win because potential supporters were being hit hardest. Mr Hain was speaking after the BNP won a seat at a by-election for Sevenoaks Council in Kent. The seat, in the Swanley St Mary's ward, was previously held by a Labour councillor. BNP candidate Paul Golding received 408 votes, beating Labour's Mike Hogg by 86 votes. Mr Golding said local young people had voted BNP because they found it "almost impossible" to get a council house. He blamed a policy that allocated council houses to "foreigners and asylum seekers". Mr Hain said: "All political parties, but especially the Labour party, have got to prioritise the fight against the BNP." He said there was a "real danger" of complacency in the Labour party. "It is areas when Labour has traditionally been strong - like Swanley - where the BNP has been making a great deal of headway and exploiting fears and spreading their racist and fascist beliefs. "We need to take them on at the grass roots level and as a government we need to be making sure that we address the fears the BNP are exploiting." BNP deputy leader Simon Darby said the recession and people's fears about the economy were the main factor in its victory - which the party has hailed as a "significant breakthrough" in south-east England. He said: "The credit crunch - or the depression as it now is, is no longer a spectator sport and it is starting to hurt our people very hard." Mr Darby said the party - which says it has about 100 council seats in Britain - was looking forward to the European parliament elections in June. "We will do very nicely indeed," he predicted. Mr Hain denied that Gordon Brown's speech in which he promised "British jobs for British workers" had helped the BNP to win. Instead he blamed the controversy over foreign companies who brought their own workers into Britain, rather than employing local people. He said he "did not believe" assurances that the companies were not undercutting local wages and ignoring nationally-agreed pay and conditions agreements. Giving local people the first chance to apply for new jobs should be a "priority", Mr Hain added. The Conservative MP for Sevenoaks, Michael Fallon, described the BNP's victory as "worrying".